"As with any Olympics, there is a certain expectation of greatness when it comes to the opening ceremony. The Pyeongchang Winter Olympics certainly did not let viewers down with their curtain unveiling. They actually created a record-setting never before witnessed site involving drones. - It isn’t possible to deny that drones continue to increase in popularity as the years move forward. They’re being used for a variety of purposes that no longer include just recreational. With incredible cameras equipped on many of them, they are able to film and capture pictures that would have never been imaginable in the past. - Intel, which is a major computer manufacturer and sponsor of the Olympics, went all out with the opening show this year. They used a coordinated swarm of 1218 Intel Shooting Star drones to create something that has never been seen before. - While coordinating these drones, Intel also managed to capture a Guiness World Record for “the most aerial unmanned vehicles simultaneously.” Each of the drones involved in this event were a foot long and weighed approximately 8 ounces. These drones were constructed of plastic and styrofoam and lit up the skies in pre-designed animation. Check out what's new in open source drone hardware, software, and related projects. "Editor's note: This article was originally published in December 2016 and has been updated to include additional information. Over the past few years, interest in civilian, military, and commercial drones has grown rapidly, which has also driven the maker community's interest in open source drone projects. - The list of unmanned aerial devices (UAVs) that fit the moniker of drone seems to be constantly expanding. These days, the term seems to encompass everything from what is essentially a cheap, multi-bladed toy helicopter, all the way up to custom-built soaring machines with incredibly adept artificial intelligence capabilities. - The drone-building community has created many software and hardware projects under open licenses that allow you to build, repair, customize, and experiment with your own drone, or to supplement the use of drones in some other way. Let's take a look at some of those projects. The LibrePilot software suite is designed to control multi-copters and other radio-controlled drones. One of the more interesting ways drones are impacting everyday life is in journalism, especially amateur investigative journalism, bringing an eye to the sky to document what's going on in the world around us. The Drone Journalism Lab at the University of Nebraska-Lincoln exists to educate journalists about how drones can be used legally and ethically as a part of the journalistic process. To further that goal, the project has open sourced its operations manual, available on GitHub or as a PDF, under a Creative Commons license to bring best practices to any news organization hoping to use a drone to further its reporting capabilities. This is definitely an incomplete list of open source drone projects; others you may want to check out include MatrixPilot and AdaPilot. Since we plan to add to this list, please let us know what other open source or open hardware drone projects are out there. Which ones are targeted towards relative beginners, and which ones are going to take more effort and commitment to put to use? Share your insights in the comments below. "What is a drone and how do drones work is answered here in this easy to understand article. Drone technology is constantly evolving as new innovation and big investment are bringing more advanced drones to the market every few months. Below, we discuss UAV technology on the most popular drones on the market which have all the latest drone technology. Most drones will have very similar systems incorporated. One of the most popular drones on the market is the DJI Phantom 3. This drone was very popular with professional aerial cinematographers. While slightly old now, it uses plenty of advanced technology which is present in the very latest drones. This UAV is ideal to explain drone technology because it has everything in one package. It includes the UAV, gimbal and camera and uses some of the top drone technology on the market today. In only a few months since writing this article, some new and highly advanced drones such as the DJI Mavic, Phantom 4 Pro and Inspire 2 have come to the market. The fast pace of drone technological innovation is tremendous. I’ve included these latest drone technology advancements in the below article. So it is right up to date including the links. What are drones used for answered here covering every sector you can think of. Drones are being used to save lives, environment works, archaeology, farming, property management, mining, construction and much more. 17. 1. 2018 - Kevin Gallagher - co-founder, CEO and pres.of Simulyze, Ing. "For many years the drone market was slow to take off. It wasn’t until 2015 that the Federal Aviation Administration (FAA) granted hundreds of exemptions for companies to operate drones in the U.S. airspace. This year (2017 ) the drone industry saw significant growth. Due to the current administration’s support for drone integration and adding of FAA regulations, UAS technology innovations have surged—and 2018 doesn’t appear to be slowing down. Check out these five predictions on the future of the commercial drone industry. Stemming from continued UAS integration efforts, a significant number of sense and avoid applications will emerge in the coming year to ensure UAS flight safety. Sense and avoid technologies will enable drone operators and drones themselves to identify obstacles and maneuver fast-flying UAS safely and efficiently...."
Firma DJI. která se specializuje na vývoj a výrobu dronů, představila svůj nový identifikační systém AeroScope, který funguje jako elektronická SPZ pro druny. Aktualizace pro aplikaci DJI Go 4 a pro firmware dronů, umožňuje pilotovi vysílat neopakovatelný identifikační kód včetně údajů o souřadnicích, výšce, rychlosti a směru, aby příslušným úřadům umožnil rozptýlit obavy z nežádoucích aktivit. Přednastavená je volba, kdy dron nic nevysílá, kdykoli však je možné vysíláni zapnout. www.dji.com. "One-north", which has been designated Singapore's first drone estate, will help the growth of high-tech companies with unmanned aircraft capabilities and spur commercial partnerships. "SINGAPORE - Expect to see more drones flying around one-north, a research and development hub in Buona Vista which will be designated as Singapore's first drone estate. The aim is to provide companies and research institutions with an urban environment for test-bedding innovative unmanned aircraft systems (UAS). This will help the growth of high-tech companies with unmanned aircraft capabilities and spur commercial partnerships, said Transport Minister Khaw Boon Wan on Monday (Feb 5). He announced the initiative at the opening of the Singapore Airshow Aviation Leadership Summit at Pan Pacific Singapore hotel. The event was held on the sidelines of the biennial Singapore Airshow and was attended by civil aviation and airline chiefs, as well as other industry bigwigs, including Mr Olumuyiwa Benard Aliu, president of the International Civil Aviation Organisation (ICAO), and Mr Alexandre de Juniac, director-general and chief executive of the International Air Transport Association....". • Soll / kann ich meine Kameradrohne mit in den Urlaub nehmen? • Ist das Fliegen und Filmen mit einer Drohne im Skigebiet eigentlich erlaubt? • Darf ich bei Skifahren / Snowboarden mit einer Drohne fliegen und filmen? In Deutschland zum Beispiel gibt es kein besonderes Gesetz, welches die Nutzung einer Drohne im Skigebiet untersagt. Man darf natürlich nicht im Naturschutzgebiet oder über Menschenansammlungen fliegen. Außerdem muß das Fliegen in Sichtweite / auf Sicht erfolgen. Čech vyrábí drony, které jdou na dračku po celém světě. "Špičkové bezpilotní letouny vyráběné v pražské Radotíně jsou bez problému schopné doručit 100 kilogramů nákladu na vzdálenost 1500 kilometrů. Není divu, že o ně mají zájem energetické a těžební společnosti a vojenské složky po celém světě. Vývoj prvních dronů začal v továrně v Radotíně v roce 2014. Do konce roku 2017 jich firma Primoco vyrobila rovných čtyřicet a nyní produkuje v průměru jeden stroj za týden. Uplatnění našly letouny v armádě, ale i u těžebních a energetických společností po celém světě. Podívej se, jak parádně vypadají v akci.....". Deník PRÁVO 9. 2. 2018: "Systém na přesné měření radiace pomocí dronu představili ve čtvrtek v Třebíči experti ze společnosti NUVIA." Problematika aplikace dronů pomalu, ale jistě, proniká i na stránky denního styku. PRÁVO se věnuje aplikaci dronu, kterou česká firma vyvinula jako první na světě. Cituji vybrané části článku:"Bezpečný způsob identifikace zdroje radioaktivního záření se spolehlivými údaji může být pomocníkem vojáků, záchranářů, výzkumníků, ale i soukromých firem. 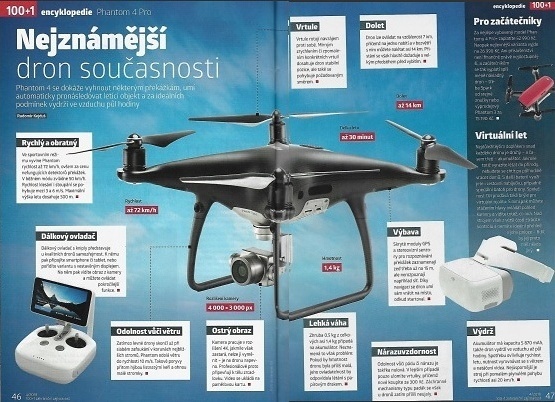 Unikátní technologie, monitorovací systém Drones-G, vznikal pět let. Dron BRUS (bezpilotní rotorový univerzální systém) vyvinul státní podnik Vojenský technický ústav (VTÚ). který na komplexu s firmou NUVIA spolupracoval. Podle ředitele VTÚ Jiřího Protivy je přístroj schopen unést až osm kilogramů a létat je schopen 40 minut do vzdálenosti několika kilometrů. Oproti vrtulníku létá v nižších výškách a obsluha není vystavena riziku...."
"...Třebíčští vývojáři vyvinuli technologii, která dokáže pomocí speciálních algoritmů radiaci na povrchu zemč spočítat. Dokáže také za letu rozpoznat jednotlivé typy radionuklidů, což, je důležité pro rychlé rozhodování zásahového týmu. Naměřená data se operátorovi zobrazují on-li-ne na monitoru počítače a díky použití GPS se jednoduše přenesou do mapového podkladu." Unikátní systém ... může být využit při sanaci lokalit po těžbě uranové rudy, v teritoriích, kde v minulosti operovaly vojenské jednotky, či na místech s výskytem historického odpadu, u nějž je riziko kontaminace. Mohou také pomoci odhalit nelegální transport radioaktivního nebo jaderného materiálu. Třebíčská NUVIA .... v oblasti monitorovacích systémů firma rozvíjí slibnou spolupráci i s Fakultou elektrotechniky a komunikačních technologií VUT v Brně. Společně s tamními vědci pracují na vývoji radiačního detekčního systému, který bude součástí záchranářského robota Morpheus. Jak jsem již uvedl v jedné z minulých zpráv, potěšilo mne, že se tématice dronů hodlá věnovat časopis "100+1 Zahraniční zajímavost". Tak se i stalo a tak vám mohu citovat několik částí textu a odkázat na kopii fotografie nejznámějšího dronu Phantom 4. - Někdejší armádní technologie je dnes díky levnější výrobě i materiálům dostupná běžným smrtelníkům. Místo útočení na cíle máme bezpilotní letouny pro radost nebo je zaměstnáváme třeba postřikem polí a pod. - Velkou část z nich vyrobí čínská firma Dá-Jiáng Innovations (DJI), největší producent bezpilotních letounů pro civilní využití, jež působí na trhu už dvanáct let. - V Česku se můžete vydat jen tak daleko, jak sami vidíte. Maximální povolená výška letu činí 300 m, v případě nízké oblačnosti méně. Pokud je dron těžší, potřebujete k jeho provozu letecké zkoušky. Na obrázku je fotka dronu Phantom 4, obsahující komentář k jednotlivým částem dronu, tak jak ji uvádí na závěr svého článku časopis "100+1 Zahraniční zajímavost". Ein immer beliebter werdender Sport ist FPV Racing: Dohnen Racing ist ein anderer Begriff dafür und beschreibt Piloten die per First Person View ihre Drohnen durch einen Parcour steuern. Dabei treten sie gegeneinander an, ähnlich den heutigen Autorennen. - Der Vergleich von Drohnen Racing mit Autorennen ist, zugegeben, etwas altmodisch. Eher passen würde ein Vergleich mit dem Rennen in der ersten Folge von Star Wars. Autos gibt es schon über hundert Jahre und so wirklich spektakulär sind Autorennen für die meisten vor allem dann, wenn man selbst fährt. Leider macht sich das auf der öffentlichen Straße nur allzu oft bemerkbar. Das ist irgendwo auch logisch, denn die wenigsten können es sich leisten, mit aktuellen Top-Rennwagen an der Formel1 teilzunehmen. Bei Drohnenrennen sieht das anders aus: Das Hobby bzw. der Sport steckt im Vergleich zur Formel1 zwar noch in den Kinderschuhen, doch kann sich eigentlich jeder eine Drohne und die für einen FPV Flug nötige Ausrüstung leisten. Umso spannender und ubiquitärer könnte der Sport werden! ".... All diese Sportarten können auch im heimischen Vorgarten gespielt werden – sehr viele können sich damit identifizieren, können mitreden. Genau das könnte mit FPV- bzw. Drohnen Racing jetzt auch erstmals bei „Rennen“ geschehen! - Der Reiz beim Drohnen Rennen liegt aus Sicht des Piloten ganz klar in der Selbsterfahrung. Als Pilot steht oder sitzt man ruhig da, hat die FPV-Brilleauf, wirkt entspannt. Doch im Kopf spielt sich eine Simulation ab: Man sieht aus Sicht der Drohne, man steuert sie intuitiv, man ist die Drohne. - Um dieses Gefühl zu verstehen, muss man es einmal erfahren haben – wir raten jedem, der im Bekanntenkreis jemanden mit einer FPV Drohne hat, es einmal auszuprobieren. Besonders dann, wenn man dem Thema Drohnen kritisch gegenüberstehst! "While much has been written about the impact of drones and artificial intelligence in property/casualty insurance over the last few years, the first real test of these emerging technologies didn’t occur until the 2017 hurricane season. - After Hurricane Irma battered Florida, reinsurers and insurers of all sizes (small, midsize and top 10) looked to facilitate their claims processing through the use of drones and artificial intelligence. - One of the most critical factors in post-catastrophe claims processing is capturing and documenting the situation on the ground. Traditionally, this is done using on-the-ground claims adjusters and is supplemented by imagery captured from airplanes or satellites. - One of the benefits of drones is that they can quickly and safely capture many high-resolution photos after catastrophes. Unlike satellites or airplanes, drones can fly a few feet away from the surface of a home, apartment building, high-rise or even stadium to document the damage to the top and sides of these structures......"
- For many of our customers, Hurricane Irma was the first time drones were used for catastrophe response...."
- Hurricane Irma demonstrated the value of drones in catastrophe response, as well as showcased how the insurance industry is willing to embrace the latest technology in order to benefit their clients....". "CNN was been awarded a waiver under the Federal Aviation Administration’s (FAA) Part 107 to operate unmanned aircraft systems (UAS) safely over people in real-world operating conditions. - According to press release from law firm Hogan Lovells, which helped the major news channel secure the approval, the waiver allows CNN to fly the Vantage Robotics Snap drone over non-participating members of the public up to an altitude of 150 feet above ground level. There are no restrictions based on population density – which will, for the first time ever, enable wide-ranging flights in urban and suburban environments, says the law firm. - “This waiver signifies a critical step forward not only for CNN’s UAS operations but also the commercial UAS industry at large,” says David Vigilante, senior vice president for legal at CNN, in a company blog. - This summer, CNN, which has its own Aerial Imagery and Reporting unit, CNN AIR, received a Part 107 waiver for closed-set UAS operations, allowing drone flights over people for motion picture and television filming in a controlled environment. Last year, CNN also secured a waiver to operate a Fotokite Pro – a small, tethered drone – over areas with unsheltered people who are not directly participating in the UAS operation. - As of today, the FAA has issued 1,317 Part 107 waivers, but only seven of them (or .005%) allow drone operations over people, notes Hogan Lovells. Though the odds of filing a successful waiver application for operations over people may seem daunting, CNN’s new waiver could now open the door to additional approvals, the law firm points out.....". Sgt. Hoster said they have linked up with Dedrone and Aerial Armor to catch drones flying over the area. "A device, a box with antennas, and when those drones pop up, that detects their usage in the area, and lets the operator know, and then we send out messages to folks in the area to look for it and try to find the operator," said Sgt. Hoster. The data caught by the detector is collected and analyzed by a software. The analysis of the information is picked up automatically, and then triggers alarms to alert the security staff of an unauthorized drone. Sgt. Hoster says There are reasons for banning drones from flying over an event like the Waste Management Phoenix Open. "Drones at an event like this could hurt or injure people, if it were to crash or cause panic to a large crowd," said Sgt Hoster. - Security officials will use drone technology to keep the Olympic Games safe from any unmanned aerial threats. - Staging an event as high-profile as the Winter Olympics is no simple feat. And the upcoming games in Pyeongchang, South Korea, is no exception. .... Pyeongchang is 183 miles southeast of North Korea's capital city Pyongyang. .... South Korean officials are going to great lengths to ensure every spectator and athlete remains safe throughout the two-week event. So much so that security personnel will even be monitoring the skies for suspicious drones. And their plan of attack if they spot a whirling machine that may cause harm? Attack it with another, larger drone. - According to an article in Quartz, officials are able to take down a suspicious drone by using a drone of their own. The security-led drone would drop a net over a potentially dangerous unmanned device, rendering it ineffective of flying any further. The types of threats could include "bomb-carrying drones," according to Quartz....". "There are real-life situations where looking from above lets you see more. - A few years ago, a county Extension educator was trying to figure out why every so often across a cornfield, two rows were pale green instead of dark green at tasseling. He never figured out the pattern. He couldn’t get above the field to see exactly what the pattern looked like. - There are several options for doing this, including unmanned aerial vehicles, aerial flights and satellite images. Nielsen experimented with a UAV during the 2017 season, and was impressed with what it allowed him to see above the crop....".
" - South Korea’s security protection procedures for the Winter Olympics in Pyeongchang, starting on 9 February, incorporate a layered response to drone incursions over prohibited areas. - A tactical surveillance aircraft will hover above the event venues at all times. - Areas near Olympics venues in Pyeongchang, Gangneung, and Jeongseon will be classified as no-fly zones. A drone detection radar developed by the Korea Advanced Institute of Science & Technology (KAIST) is deployed around the stadium and athlete village, backed up by 900 smart, integrated CCTV cameras. - In the event of a suspicious drone incursion security forces on the ground will deploy radio signal-jammers. In the air “drone catching” drones equipped with nets will be launched and if these measures do not work then special forces agents equipped with shotguns aboard helicopters will shoot down the intruding drones...."
"As drones increase in availability, more organizations and governments are looking for ways to protect assets from nefarious drones. Fortem has developed a system called DroneHunter that, well, hunts drones. Literally. DroneHunter involves detecting and then removing drones by shooting them down or capturing them with another drone. This is dogfighting with drones......".